The Bull Terrier was developed in England during the 1860's and 1870's. During the 1860's and 1870's the Old English Bulldog had already been extinct for decades, and James Hinks of Birmingham employed the services of his own modern English bulldog named "Madman", the English White Terrier (which was not a working or sporting terrier, the White English Terrier began its creation in the 1860's, and was first presented to the public in 1864), along with some original Bull and Terrier dogs to develop and create the breed of dog we now know as the Bull Terrier. Colored Bull Terrier's are due to Bull Terrier breeders crossing their dogs with Staffordshire Bull Terrier's in the 1900'S. With the Original Bull and Terrier blood, combined with an injection of an original strain of Bull and Terrier blood from the Staffordshire Bull Terrier in the early 1900's, the Bull Terrier still remains a formidable sporting Terrier. Bull Terriers are known as friendly and outgoing dogs, even having a "clownish" attitude about them, though they are usually not considered ideal for a first-time dog owner. Their physical strength is matched by their intelligence, and both body and mind need to be kept active. They can be fun and playful. As a breed they are generally placid and will not normally make the first move. They are very affectionate dogs that love human company. Bull Terriers are particularly good with children, and usually have a high pain threshold, which reduces the risk of injury from a defensive bite. Younger dogs, however, may regard children as playmates and because of their strength could cause inadvertent injury. They are protective of children in their charge. Bull Terriers do not make as good a guard dog as people think due to their fondness for people, but will defend his "pack" if needed. Bull Terriers are thick-set and muscular with a short, dense coat. Acceptable colours for show dogs are white, (skin pigmentation and markings on the head are not penalised in the UK show ring), any colour other than white, or any colour with white markings (although blue and liver are highly undesirable). 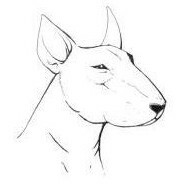 The Bull Terrier's most recognizable feature is its head, described as 'egg shaped' when viewed from the front, almost flat at the top, with a Roman muzzle sloping evenly down to the end of the nose with no stop. The unique triangle-shaped eyes are small, dark, and closely set. The body is full and round, while the shoulders are robust and muscular and the tail is carried horizontally. It walks with a jaunty gait, and is popularly known as the 'gladiator of the canine race'. There is no designated height or weight for the breed but the average is, Height: 51-61 cm (20-24 inches), Weight: 15-36 kg (35-60 pounds) The Bull Terrier is the only recognised breed that has triangle-shaped eyes.